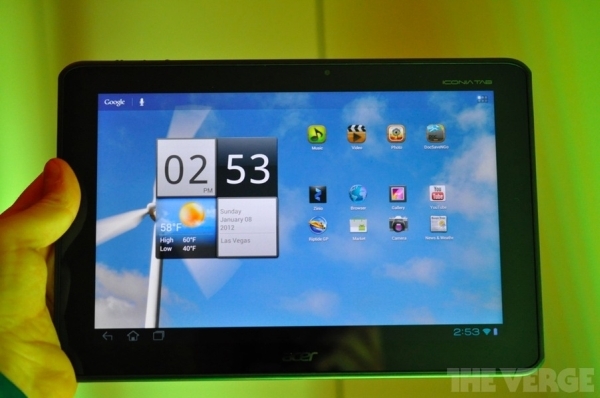 We’ve been hearing about the Acer Iconia Tab A700 since November last year. Acer has finally decided to take the wraps off the device and showcase it at this year’s CES. The biggest rumor was that the A700 would have a full HD display and thankfully that has come true. The A700 has a 10.1-inch, 1920 x 1200 resolution display, that’s the highest of any tablet available right now, including the current Android tablet champ, the ASUS Transformer Prime. That’s not all. Like the Transformer Prime, the A700 will also be running on a quad-core processor and although Acer has not specified yet which one it will be it is in fact the same Nvidia Tegra 3 processor ticking inside the Transformer Prime. Lastly, the A700 will come with Android 4.0 Ice Cream Sandwich out of the box, when it launches in Q2, this year. No word on pricing yet. We will find that out when Acer officially announces it. Click on the source link for more pictures and a hands-on video.